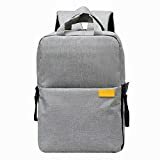 The top half can contain your notebook, accessories or other stuffs and 2nd half can contain your camera; It can also contain a 13” laptop in the backpack. Keep your camera equipment safe and organized. The top half can contain your notebook or camera accessories and 2nd half can contain your camera; It can also contain a 13 inch laptop in the backpack. The camera backpack is multi-functional. If needed, you can remove the padded interior to be a casual daypack or travel bag which is quite spacious. Twin back straps are fully adjustable and are padded for comfort. It has a rain cover in the package for waterproof. This entry was posted in Discount Photography and tagged Antishock, Backpack, Camera, Canon, Cover, DSLR, Grey, Multifunction, Nikon, Oxford, Pentax, Photography, Rain, Rucksack, SLR/, Smart, Sony, Travel, Video, Waterproof, YuHan by Ball Photo. Bookmark the permalink.